There are very few scheduled performances – in some of the chapels, and some shared rooms, there will be specific sets – otherwise the performers will perform for the entire concert – taking occasional unscheduled breaks. The best way to see everyone is just to wander, and go back to a room if it was empty when you first passed by. 5pm-5:35pm: A performance by Joel Davel, Nannick Bonnel, Peter Apfelbaum & Claudine Naganuma honors the memory of Don Buchla, whose innovative instruments and dedication to contemporary music influenced the lives of many in the Bay Area new music community. This entry was posted in 2014 on June 18, 2017 by Lucy Mattingly. For those of you who like to plan ahead, or afterwards, want to remember who you saw where, here is a map showing where the performers will be playing. Some will be sharing a room, but most will be on their own – which means there will be times when they have to take a break. Don’t despair, circle back! There are few schedules – none we can publish, but they might be posted in the rooms once you get there. 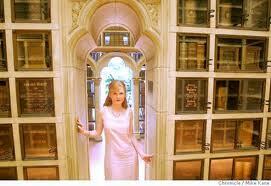 There will be a schedule for The Chapel of the Chimes itself posted in the lobby area. This entry was posted in 2014 on June 17, 2017 by Lucy Mattingly.